National Public Gardens Day is an annual observance that is held on the Friday before Mother's Day (the second Sunday in May). It was inaugurated by the Pennsylvania-based American Public Gardens Association in collaboration with Rain Bird Corporation. National Public Gardens Day was first observed in 2009. Since then, it has been recognized by various levels of government. 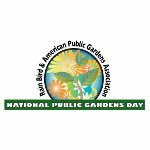 This observance focuses on increasing public awareness about the importance of public gardens as a source of educational resources for local communities and nationwide. It celebrates over 500 public gardens throughout North America including botanical gardens, zoos, historical landscapes, specialty gardens, educational gardens, farm gardens, entertainment gardens, and arboreta. On National Public Gardens Day, public gardens across the country hold various activities to highlight programs such as the preservation of green spaces, water conservation, plant conservation. Each institution has its own unique way of participation. This observance even has the national spokesperson, Paul James. Paul James is the host of the HGTV show Gardening by the Yard, he is known as “The Gardener Guy”.